Es una composición/instalación para intérpretes e instrumentos variables y láminas de acero de grandes dimensiones suspendidas en el aire y amplificadas con micrófonos de contacto piezoeléctricos. La experimentación se centra en la retroalimentación sonora y en la posibilidad de filtrar sonidos acústicos a través de las chapas. La obra es una investigación de las chapas como materiales resonantes, como objetos de sonido en el espacio. No es la música como relato lineal sino como proceso, espacio sonoro. Músicos que han participado: Bárara Togander, Bohdan Hilash, David Kant, Facundo Gómez, Florian Juncker, Guido Segal, Guillermina Etkin, Jacob Wick, Josh Shinton, Juliana Paciulli, Lobi Meis, Magnus Nilsson, Manuel Sahores, Marcos Zoppi, Mustafa Walker, Owen Stewart-Robertson, Sam Nacht, Sergei Tcherepnin, Terri Hron, Thomas Verchot, Wenchi Lazo. 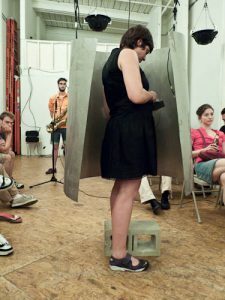 The piece is a a composition/installation for amplified sheets of metal and variable performers. These large sheets of stainless steel are rigged with piezoelectric contact microphones, which are used either as drivers or microphones. The performer’s group work is centered in the encounter between written form and improvisation. What is being investigated is sound feedback, and the possibility of filtering sound through the metal sheets. The piece is an investigation of the metal sheets as a resonant material, objects in space. The installation and the composition intend not to think of music in terms of linear development, but as something alive, a process of sounding space. Performers that have participated: Bárbara Togander, Bohdan Hilash, David Kant, Facundo Gómez, Florian Juncker, Guido Segal, Guillermina Etkin, Jacob Wick, Josh Shinton, Juliana Paciulli, Lobi Meis, Magnus Nilsson, Manuel Sahores, Marcos Zoppi, Mustafa Walker, Owen Stewart-Robertson, Sam Nacht, Sergei Tcherepnin, Terri Hron, Thomas Verchot, Wenchi Lazo. We played the chapas in pairs; for each chapa, one performer playing at it and the other playing the chapa itself. Facundo Gómez—López’s partner in acoustic crime—shook, bent and uncurled the metal sheet, capturing and transforming the sounds of my saxophone into disembodied and transfigured specters of ringing feedback. It was a strange kind of duet. It felt like we each had one hand on the same instrument. It felt like someone was taking the voice right out of my throat and manipulating it before it ever reached my own ears. At times, the sound of my saxophone and the sound of the chapa were completely indistinguishable. Then the metal sheet trembled and the sound split into two halves. Sometimes I tried to mimic the sound of the chapa, and other times I struggled to distinguish myself from it. I felt an overwhelming sense of being part of the machine, part of this immense acoustic mechanism. In contrast to the all-too-often disembodied sensation of performing electro-acoustic music, this was not my sound and processed sound. It was not about input and output. It was just one giant edifice of physicality and acoustic resonance. 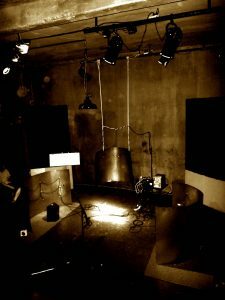 This particular performance for ISSUE Project Room’s 15-channel speaker system nicely complements other recordings of Música Mecánica para Chapas. 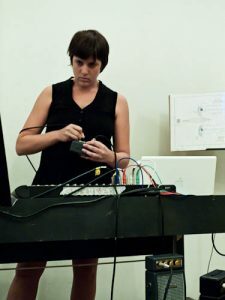 The performance was more subdued and subtle than others, but still retains López’s characteristic controlled chaos of feedback and eerie sonic simulacra.